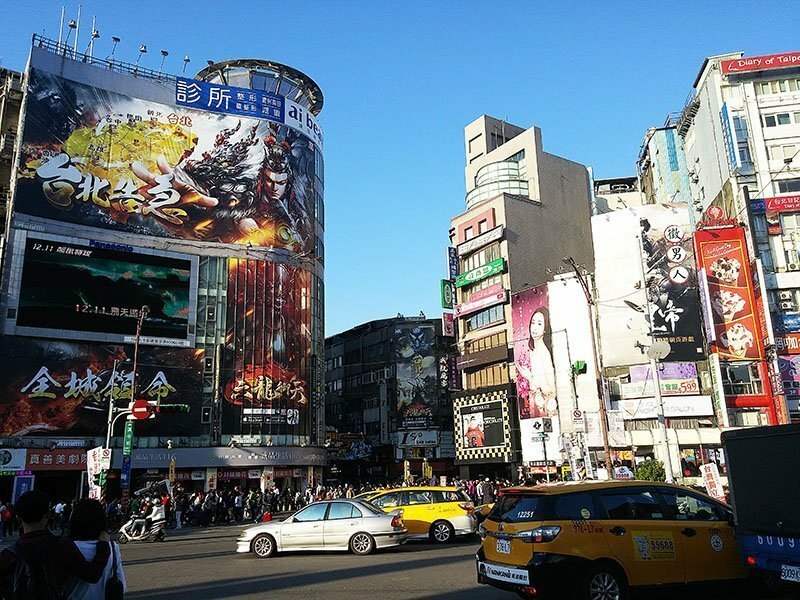 During my two visits to Japan, I’ve only stayed in Osaka for a short period of time. 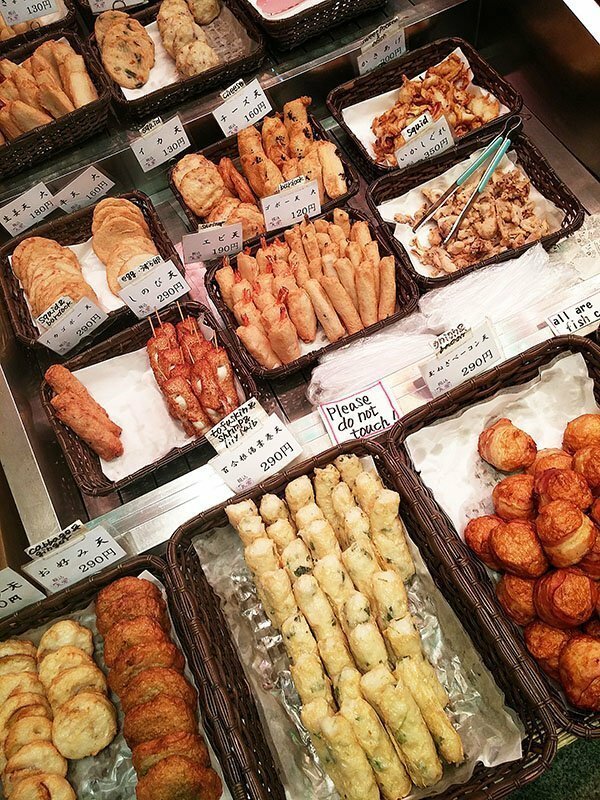 That meant I had to carefully select my activities when exploring Osaka. 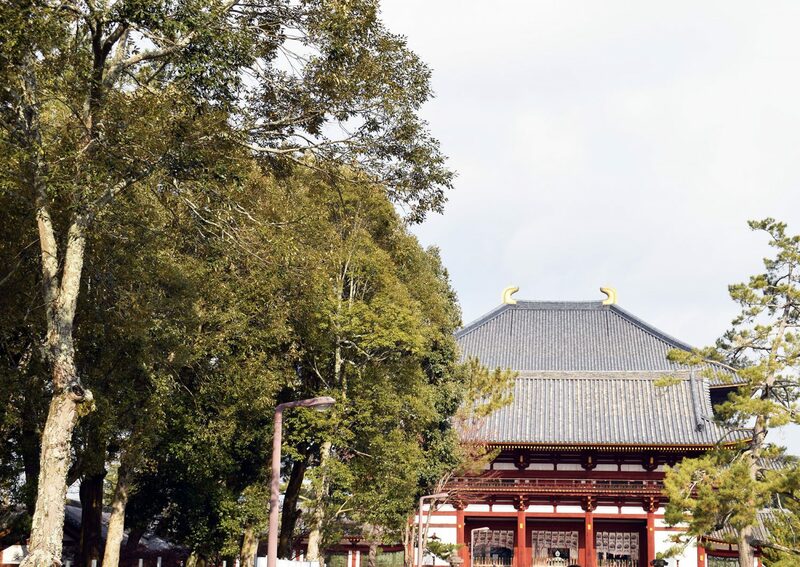 Although the city has much to offer from the Osaka castle to the aquarium to Spa World, I decided to split my time between Universal Studios and Nara. 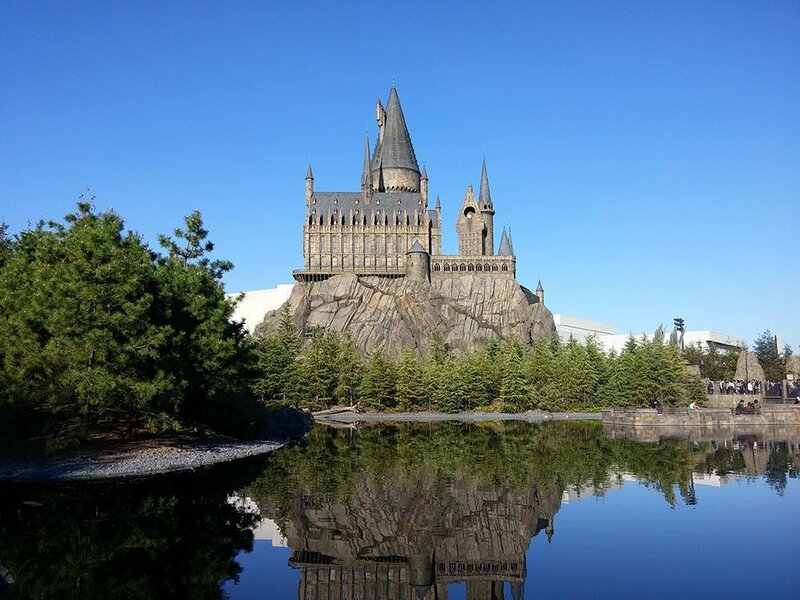 The Universal in Los Angeles had not yet built the Wizarding World of Harry Potter; as a huge fan of the series, I made it a must to visit. 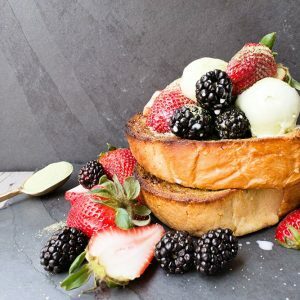 As expected, it was everything and more! 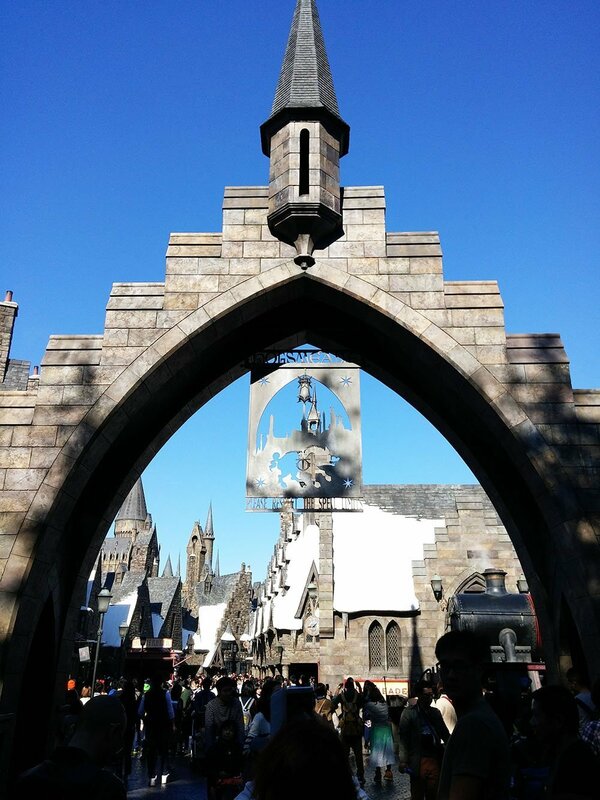 Walk through the forest path to enter the amazing Harry Potter World. 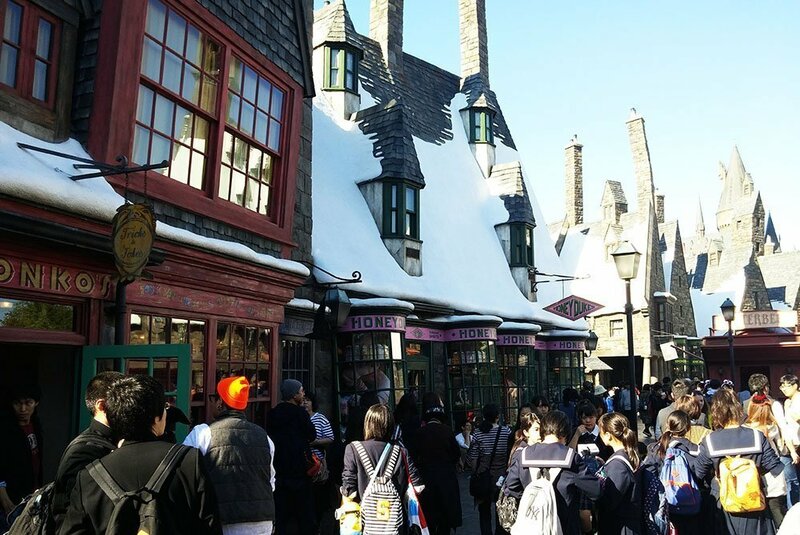 Expect large crowds of people no matter what day of the week you visit. Even during the beginning of November on a Monday, there were hoards of people left and right. It even appeared as students were taking a field trip. 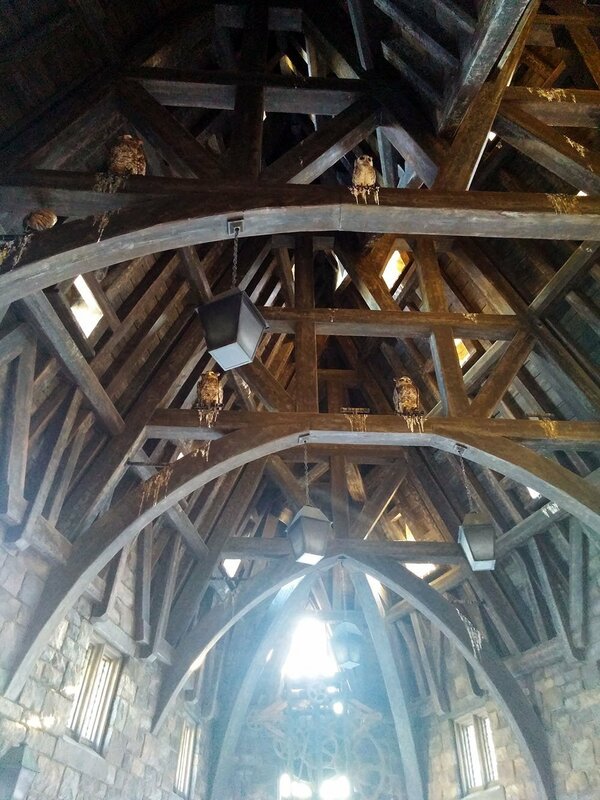 The attention to detail put to building Harry Potter World is astonishing. Every store appears just as it does in the movie. Line up at Ollivander’s to see Ollivander himself and purchase a wand for $50. 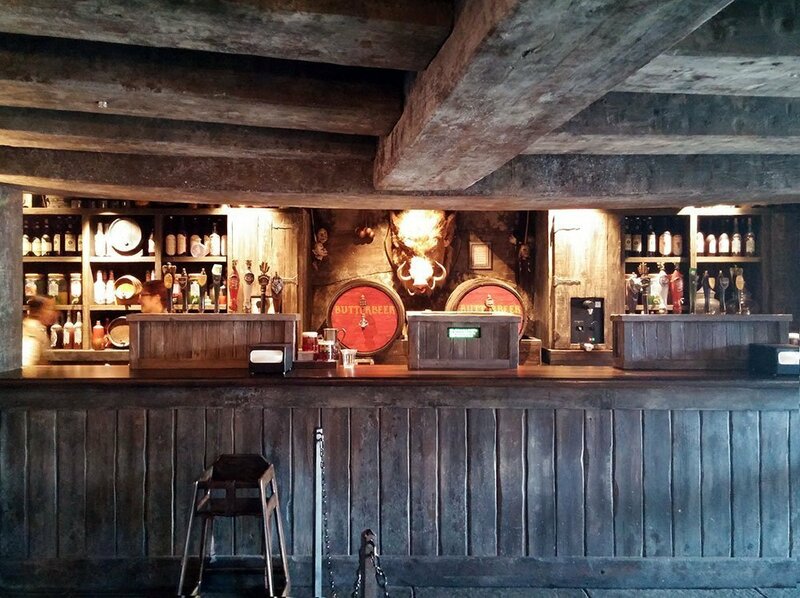 Visit Honeydukes for a sweet treat or the Owl Post for a glimpse at the magical creatures. After strolling through Harry Potter World, you know you have to stop by the food court and buy a pint of that famous butterbeer. 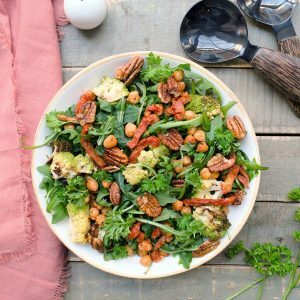 The food served is typical American fare with corn on the cob, roasted chicken, bbq meats and such. 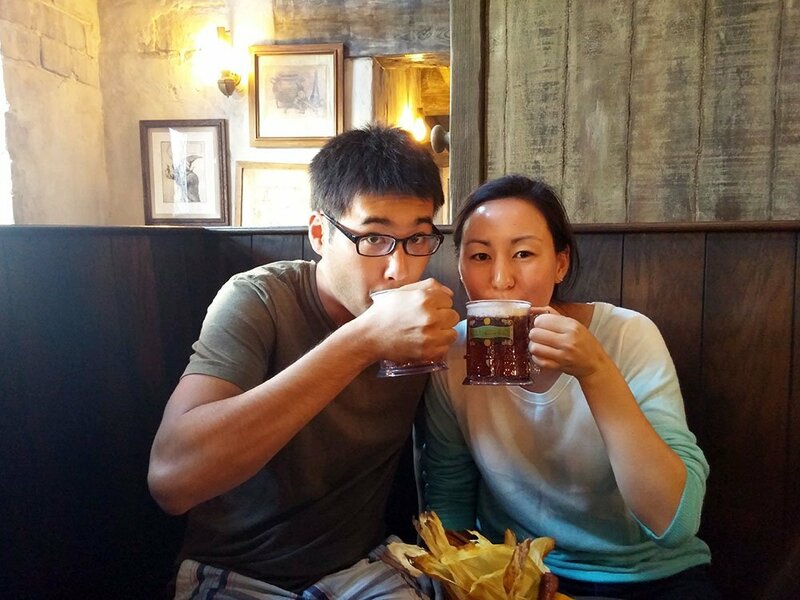 The butterbeer though? Surprisingly very sweet. Similar to cream soda, it wasn’t my cup of tea but others quite enjoyed it. I could spend hours here but at last, it was time to depart. 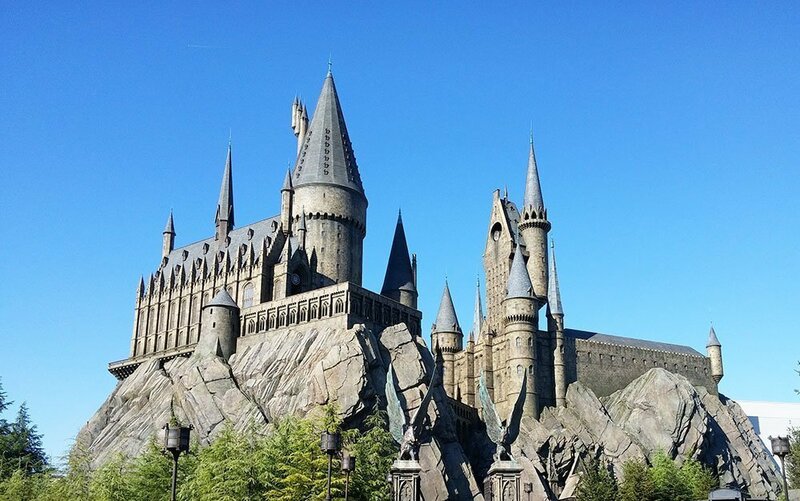 The rest of the theme park is just like any other Universal, nothing too special. 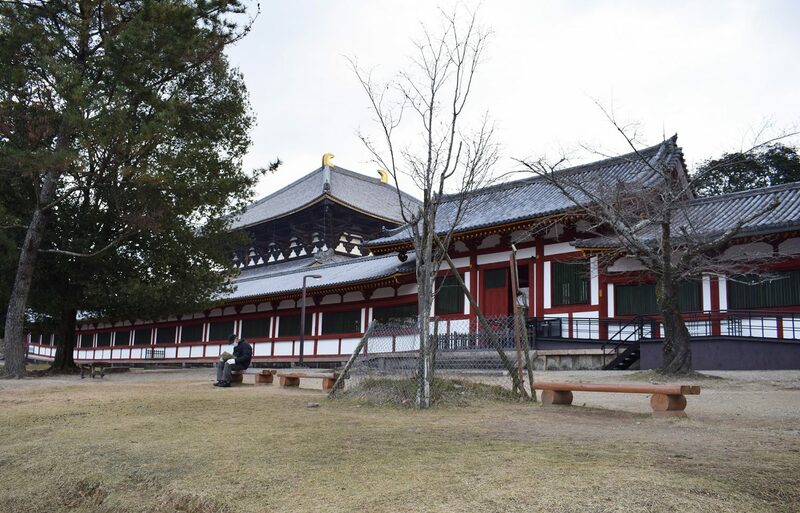 Take a break from the fantasy world and enter reality at its finest at Nara. 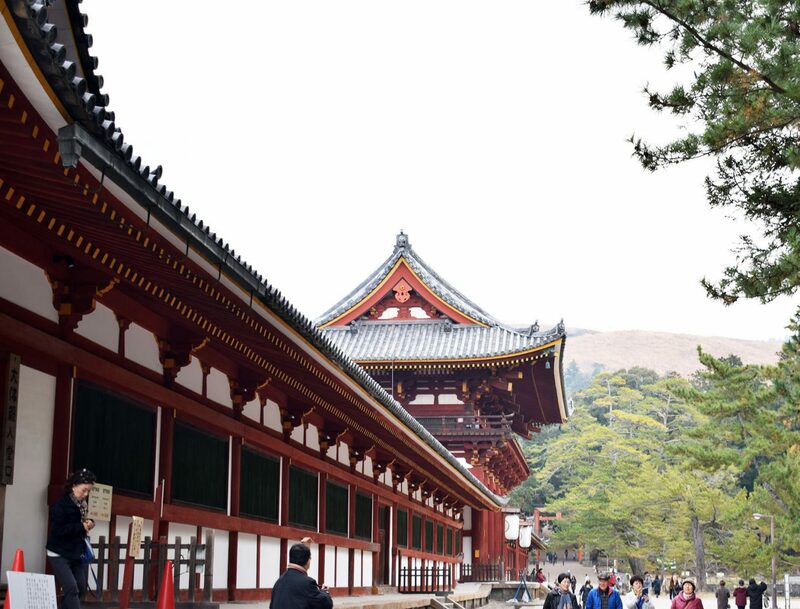 Home to the oldest Japanese temple, Nara is easily accessible with Kintetsu local, express or rapid express trains. 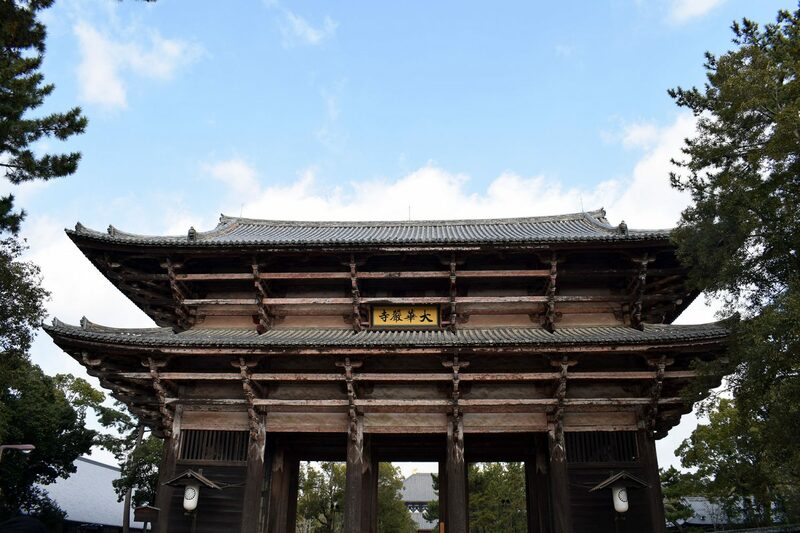 Technically Nara is not located in Osaka (about 30 minutes away) but it’s still close enough to visit if you’re staying in Osaka. 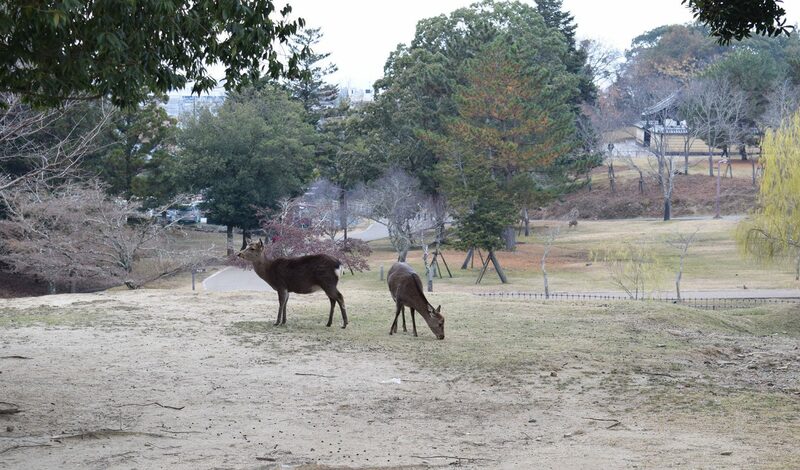 Immediately off the station, you will begin to see deer wandering the streets. 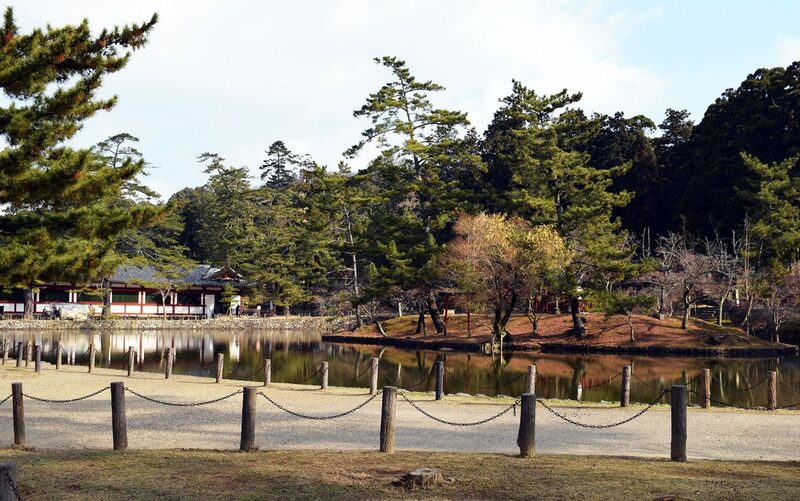 Walk towards the Todai-ji temple to see larger gatherings of the animal. Vendors along the road sell crackers that you may feed to the deer. Supposedly, the animals are trained to bow as a request for food. You, in turn, bow back and hand them a cracker. But be warned! 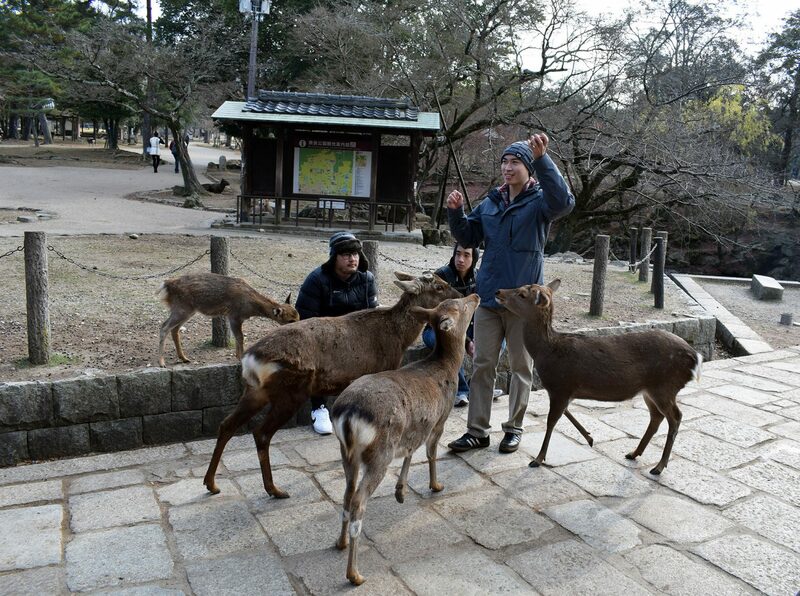 As soon as the deer know you have food and are willing to feed them, they start to swarm you. They can get a little aggressive, nipping at your clothes and following you until you give them a cracker. 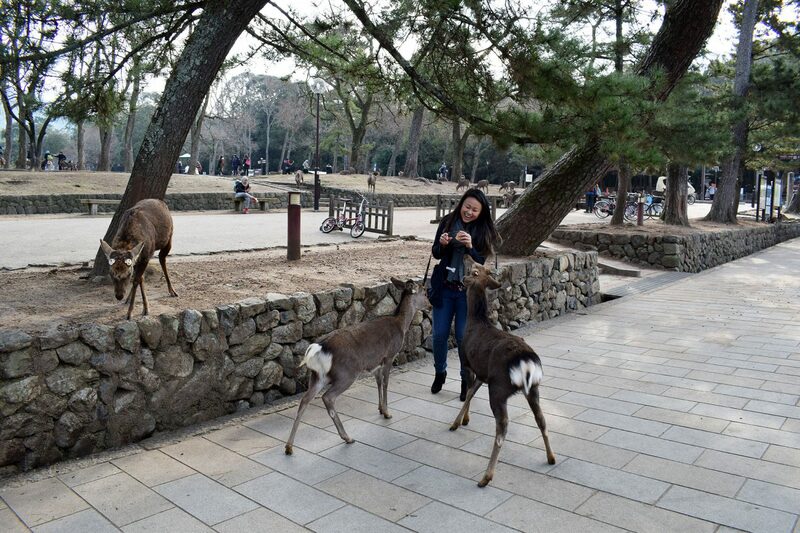 Fun little story: one of the deer snatched a girl’s 10,000 yen out of her hand, thinking it was food! So if you’re planning on feeding the animals, don’t hold out bills in your hands just in case! The larger the crowd, the more deer there are. It is quite amazing how the city has managed to keep these animals in their natural habitat. 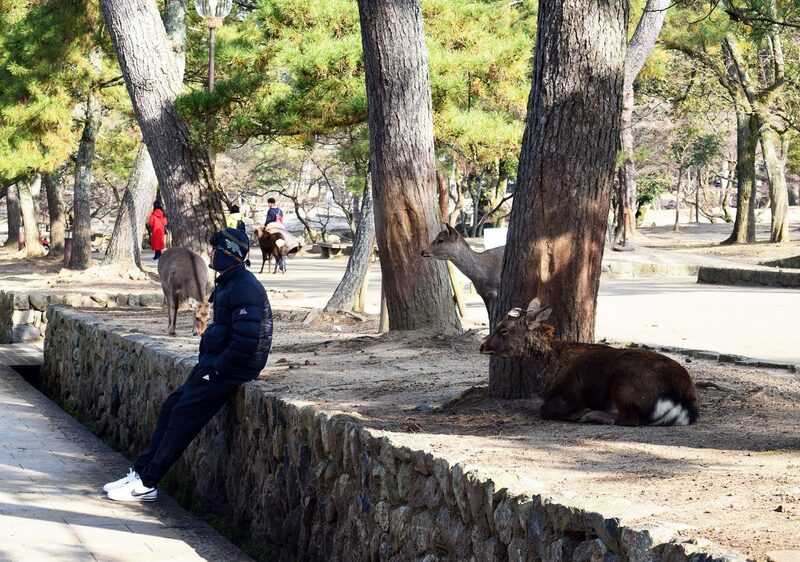 Although they had to remove the horns to prevent any attacks, the deer seem overall at peace. 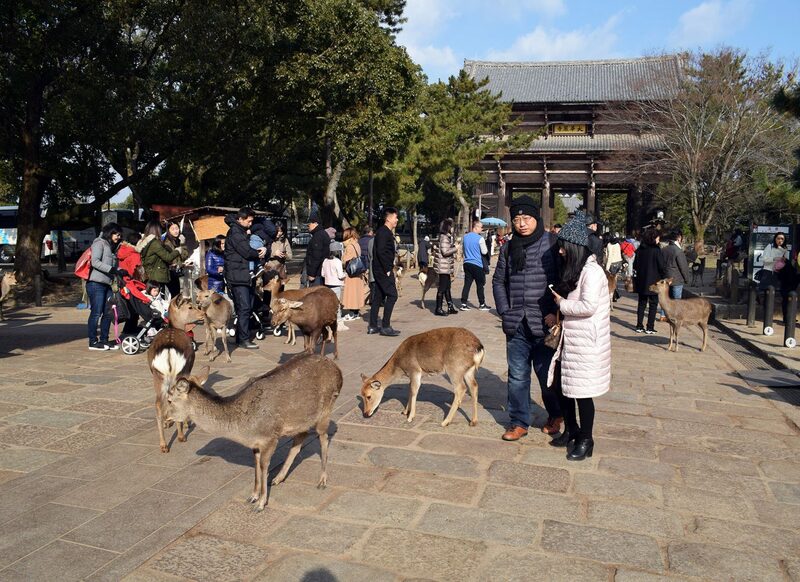 Once you’ve had your fun with the deer, enter Todai-ji Temple. Even the temples have antlers! 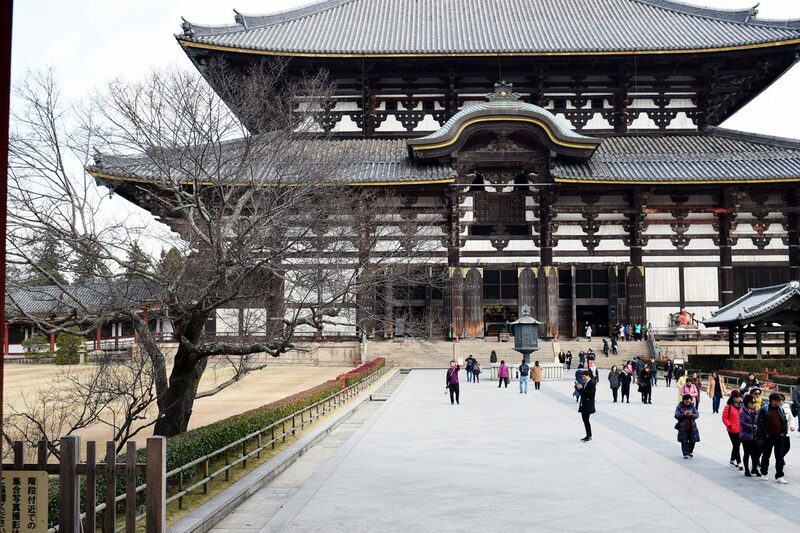 Pay a small fee to enter the temple, which is the largest wooden structure in the world and see an immense statue of the Cosmic Buddha. Souvenirs are also available for purchase inside. 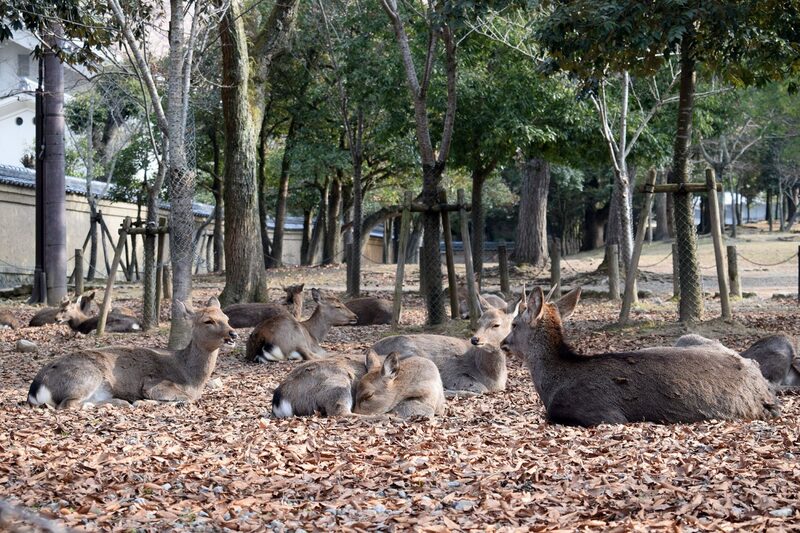 If and when I return to Osaka, I would be happy to revisit Nara Deer Park. A unique experience to say the least! 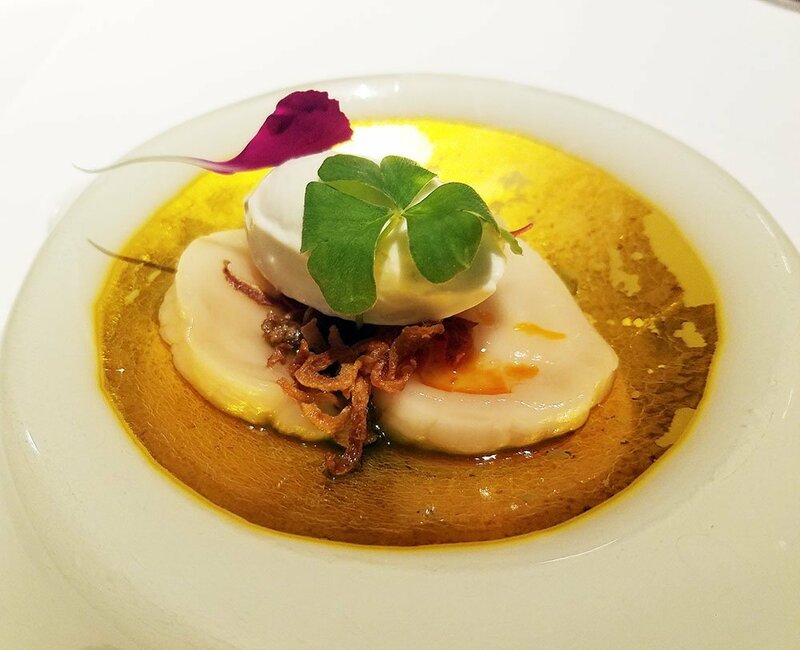 Next up, my visit to the 3 Michelin star restaurant, Kikunoi Ryotei.